When I was Emily's age, I loved the rides at the Vermont State Fair. The Yo-Yo, the Avalanche, the Wheel of Impending Death, it made no matter. I would ride and ride - never feeling queasy, never feeling anything but alive and free. One year, when the fair had a "zipper" type ride in which you spent a majority of your time upside down, my friends and I would try to rack up ride after ride in order to see who could ride this behemoth the MOST times. The last time I went on the rides at the Fair, Terrance and I were newly dating. The year was 1991, and he and I decide to go on the Yo-Yo ride. Do you know this ride? It has seats suspended by long chains, which then swing wwwwaaaaaaayyyyyyyy out over the midway as the ride lifts off the ground and moves in circles. I spent the entire 3 minute ride clutching the chains in terror, calculating the projectory of my demise. If I flew off NOW, I would most likely hit the funhouse......and if I flew off NOW, it was the Scrambler on which my body leave this mortal coil. Good Times, ya'll. Good Times. Needless to say, I did not go on anymore rides at the Fair after that moment....nor to this day. Fairs scare me. They scare me in a way that I was never scared as a child. No. 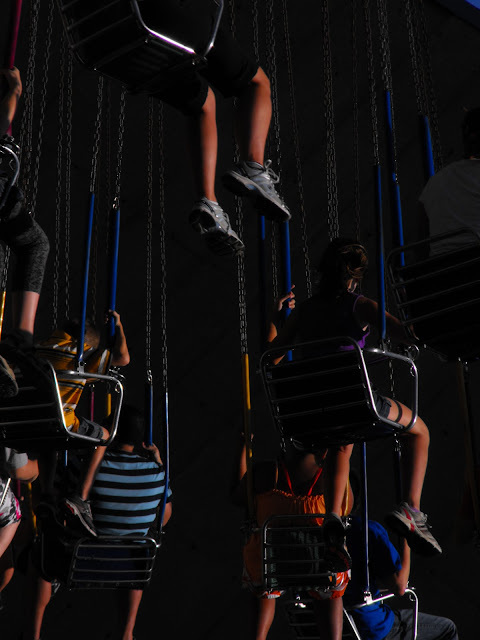 As a child, the Fair was a time of wonderful things. Fried Dough, Fries and Vinegar, small mirrors with the logos of 1980 rock bands on them, the occasional feathered roach clip which was worn as a hair accessory in my small Vermont town, and the ever present multi-layered fancy colored candles. So what happened? Did the Fair get progressively more dangerous as time went on? I don't think so. My best guess is that I crossed a threshold in which I became aware of my own mortality. Aware of my mortality in a way that was not possible for me to know, even as the precocious, street smart kid that I was. I understood that I was going to die, and that this death could come at any time from anywhere. I gained fear - true fear. Scary movies were no longer thrilling...they were SCARY. There were monsters in the world, and more often than not, they looked like people I knew. I wonder if that is the moment in which we choose to forget what it is to be a child - the moment in which we decide that we are adults and we must protect children from the dangers that don't exist for them. Is it this moment when we decide that we should crusade to protect the "innocence" of children by censoring or out right depriving them of opportunities to grow and explore? Is it this moment when we forget what it feels like to have our decisions made for us by people who aren't listening to us? I do wonder, however, if I would have been the same person if my mother had hovered over me, warning, admonishing, fussing, instilling fear of death in a person who was still learning what it was to live. Oh! We called that one the Magic Swing. I love that ride! Still. I doubt I could climb a tree as high, as fearlessly as I did before I hit adulthood. And I know bugs frighten me in a way they never used to (well, except for wasps and really big spiders. )And I used to drive like a maniac, which terrifies me even to think about, now. I'm going to try to let Sprog climb and jump and test himself, even if it means skinned knees and such. But it's going to be hard. And I'd love not to pass on my intense fear of waterbugs, but... not sure what I can do about that.